She’s running: Sen. Elizabeth Warren is entering the 2020 presidential campaign, becoming the first top Democrat to enter the primary race. 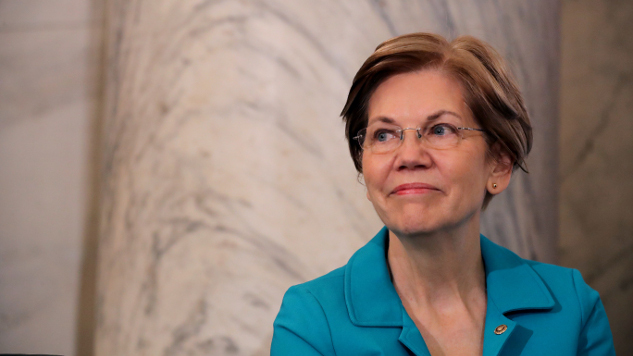 Warren announced her plans to launch an exploratory committee for president in a video shared online early Monday morning. Warren’s launch video centers on the “traps” that America’s billionaires and corporations have set against families trying to enter the country’s shrinking middle class. Families of color, in particular, face a “steeper and rockier” path toward the middle class. “Our government is supposed to work for all of us, but instead, it has become a tool for the wealthy and well-connected,” says Warren in the video. “The whole scam is propped up by an echo chamber of fear and hate designed to distract and divide us. People who will do or say anything to hang on to power, point the finger at anyone who looks, thinks, prays or loves differently than they do,” she adds, displaying the likes of Sean Hannity, Steve Bannon, Stephen Miller and President Trump. Warren’s busy 2018 included a baffling, and perhaps career-threatening, one-on-one feud against Trump over his claims questioning her Native American heritage, as well as winning a second term as Mass. Sen., but she heads into the new year as perhaps the most well-known Democratic challenger in what’s sure to be a crowded primary race. You can certainly expect 2019 to be yet another loud year for the Democratic party.